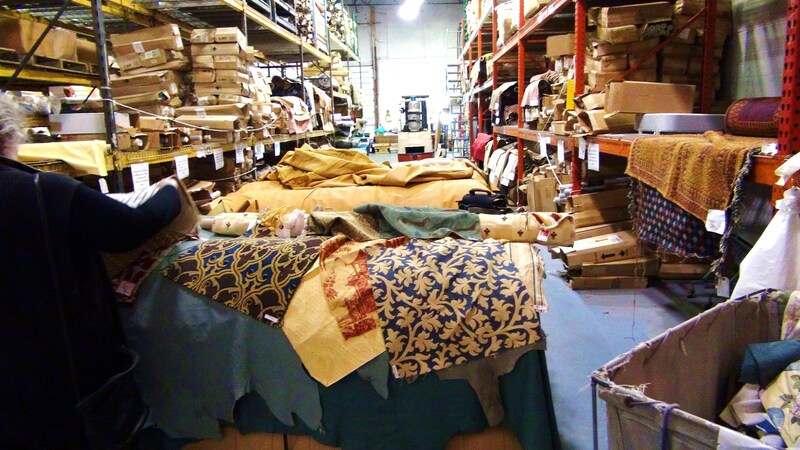 Last week I visited my favorite fabric warehouse haunt, Discount Fabrics USA in Thurmont, MD, the home of Camp David. 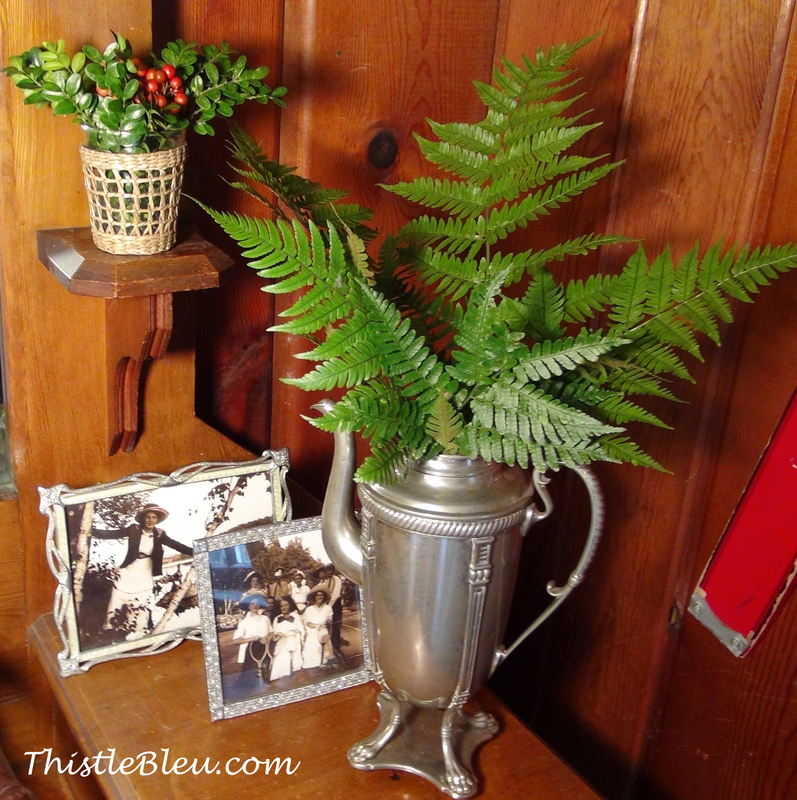 I was inspired to change up my knotty pine guest room a bit. 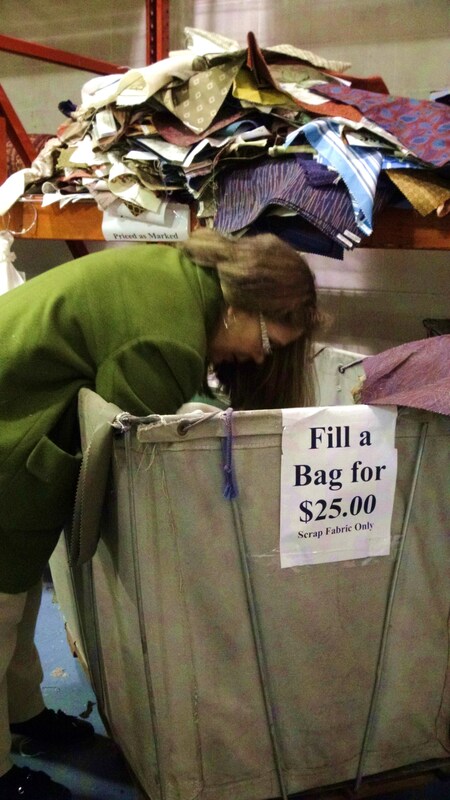 Upon entering the back room I eyed some Brunschwig and Fils fabrics in the bin marked $25 / bag. Okay, I was all in, literally. 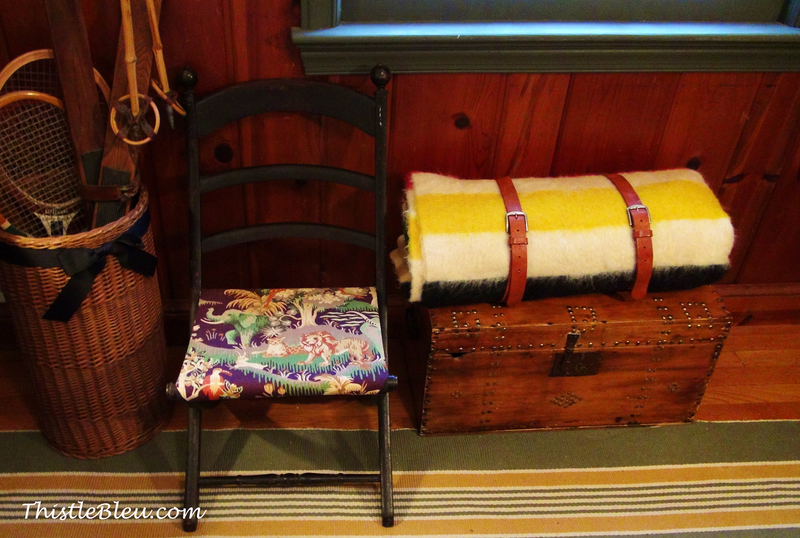 I emptied the bin and filled my bag with great pillow fabrics for my future guest room. It has been 12 years since I decorated my guest room so it is time for a change. 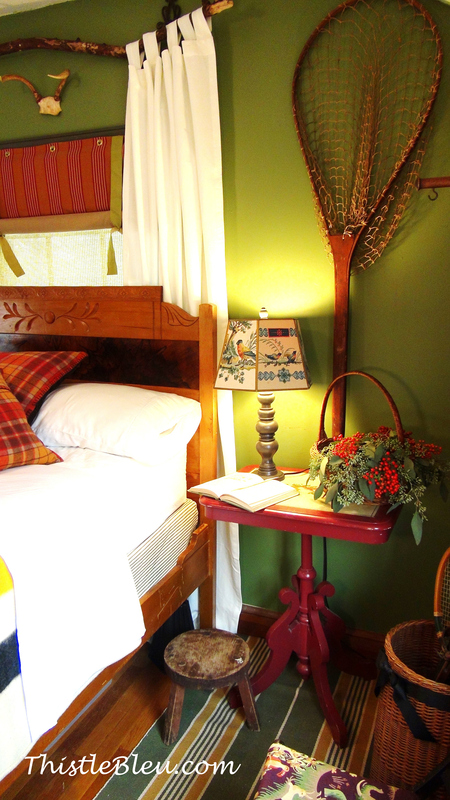 I am sharing the Adirondack Guest Room before I tweak it. 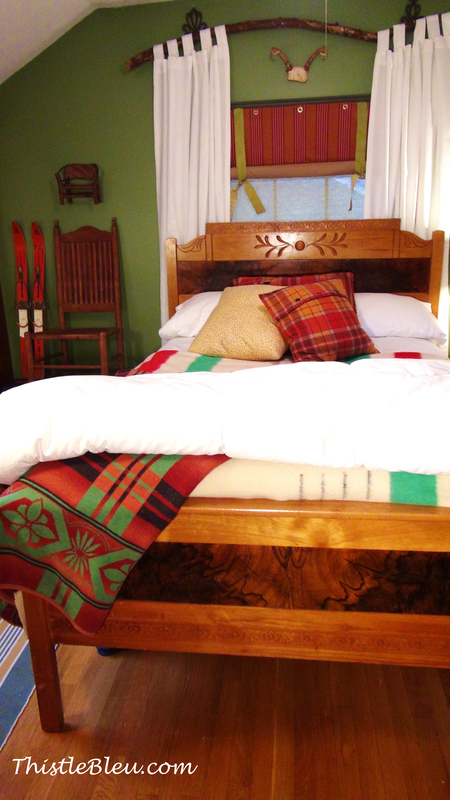 It’s time to retire the Hudson Bay blankets for awhile. 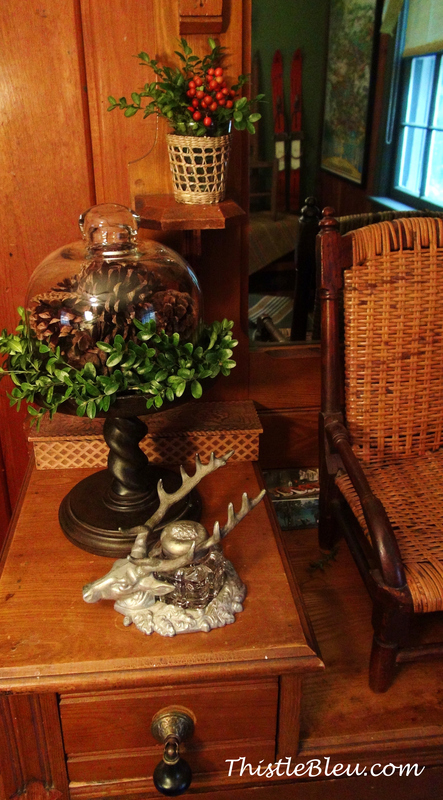 Most of this stuff was lurking in the basement so it wasn’t hard to decorate this room. 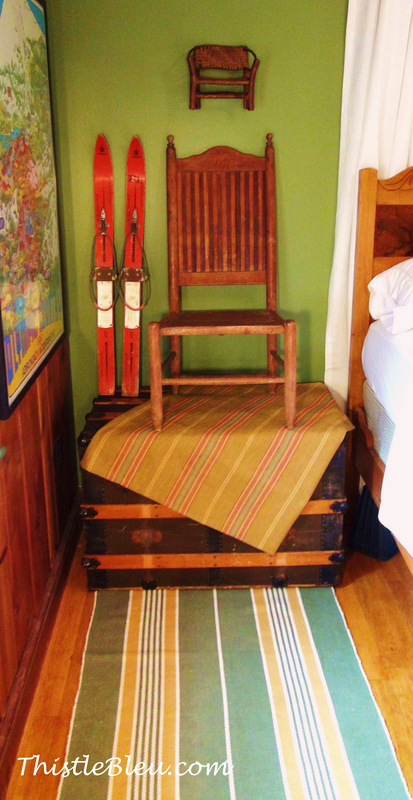 Growing up in the Finger Lakes region of New York, it was not too hard to find old fishing nets, skis, and antiques at yard sales and auctions. Some things can’t be found at yard sales like this great runner from Dash and Albert. Their rugs wear like iron and are actually washable in a laundromat’s front loader. I made the campy striped window shades and inserted gift wrap tubes in the rolls to hold them taut. 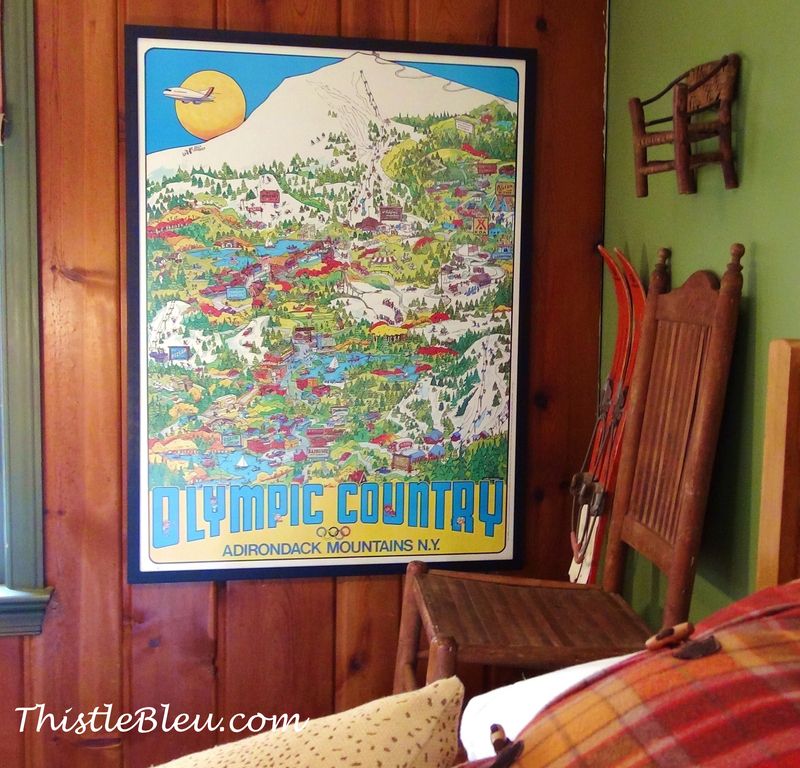 This poster from the 1980 Winter Olympics in Lake Placid was a hand-me-down from my husband’s parents. My mother-in-law grew up in Saranac Lake in what was once an old TB Cure Cottage. 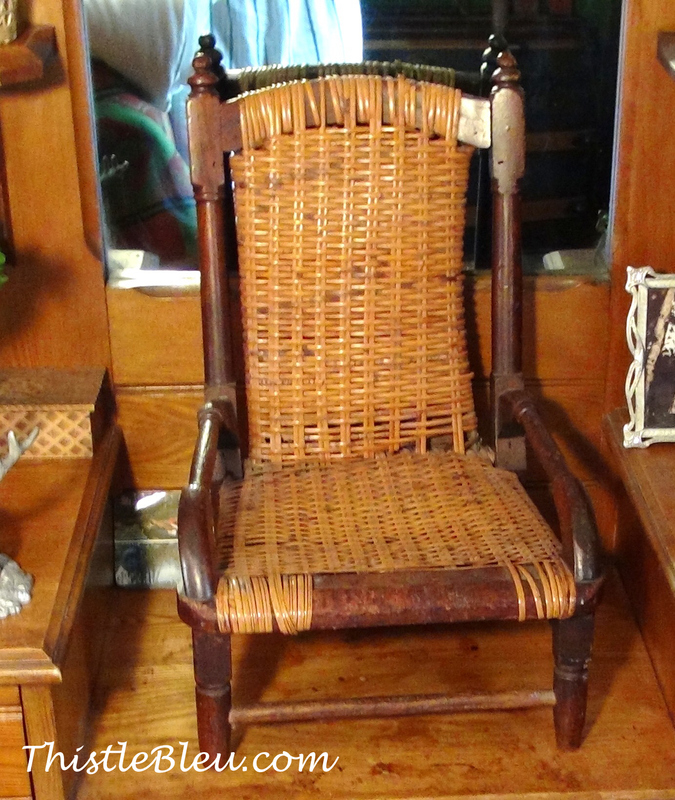 Have an old chair too rickety to sit on? Put it on display. That works. 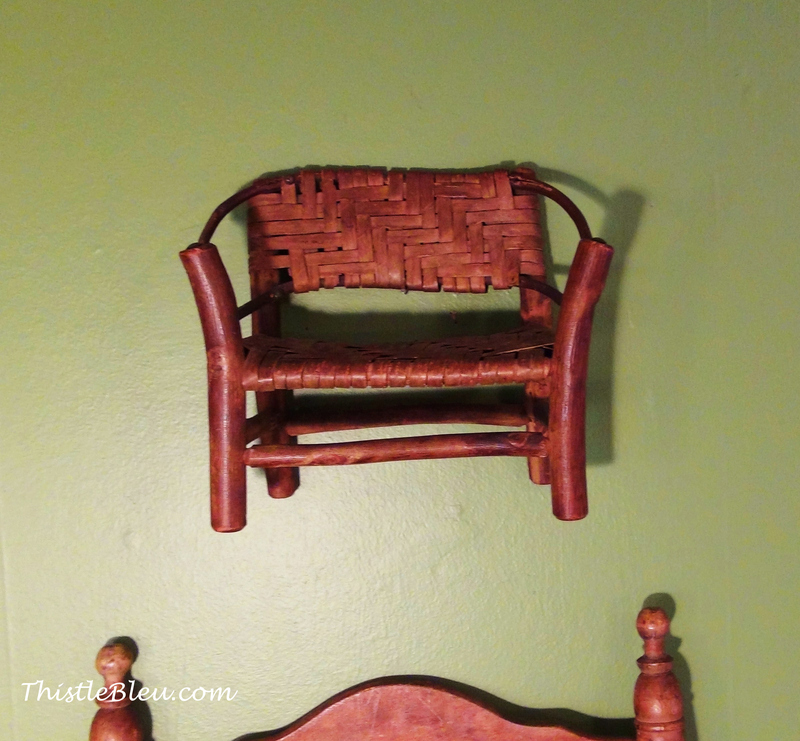 Have an antique Hickory Twig Chair that you don’t want the kids to destroy? Hang it on the wall. This was actually a salesman sample. This print hangs under the window. 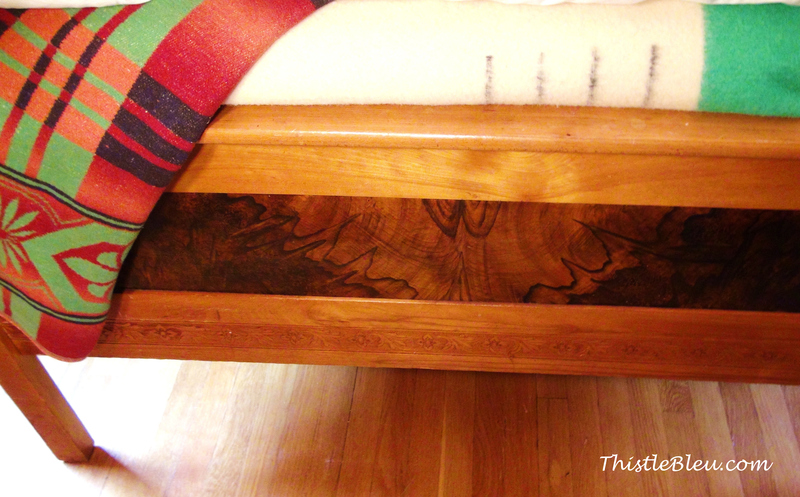 It has a relaxing quality that is nice in a bedroom. My son found this great old gnarly stick in the backyard after a windstorm. 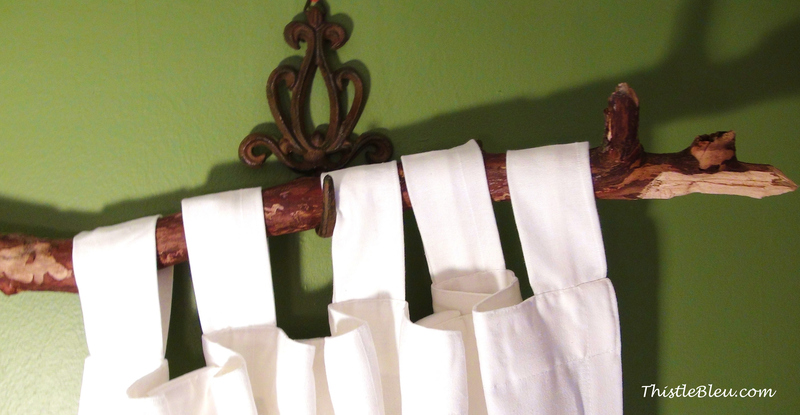 Hanging tab curtains from IKEA works well because the stick is not straight. 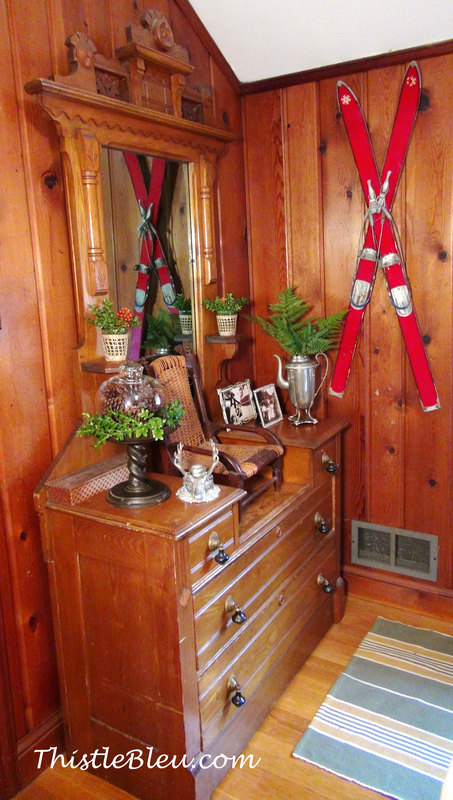 The iron hooks just add to the rustic charm. 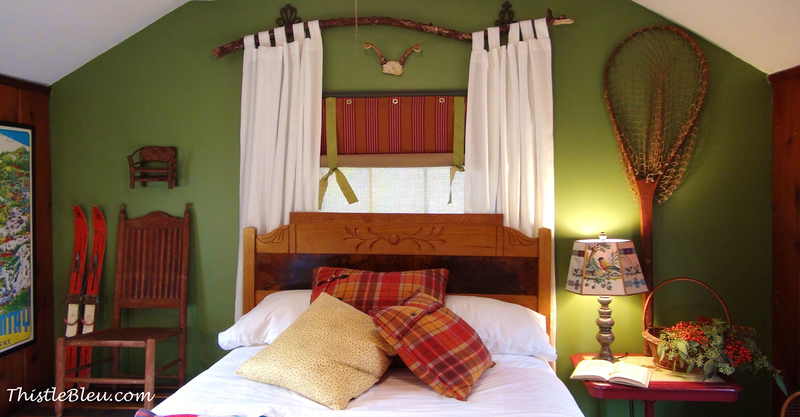 The window treatment is finished off with a pair of antlers. We hunted them down at the thrift store. The only deer in my neighborhood are in the park and in my yard eating my maidenhair ferns. Where are the real hunters when you need them? This room is very small so hanging the side panels high and not having a floor-length dust skirt help give the room some height and openness. Just a bit of pillow ticking on the box spring is all that is needed. The fishing net displayed up high also helps. 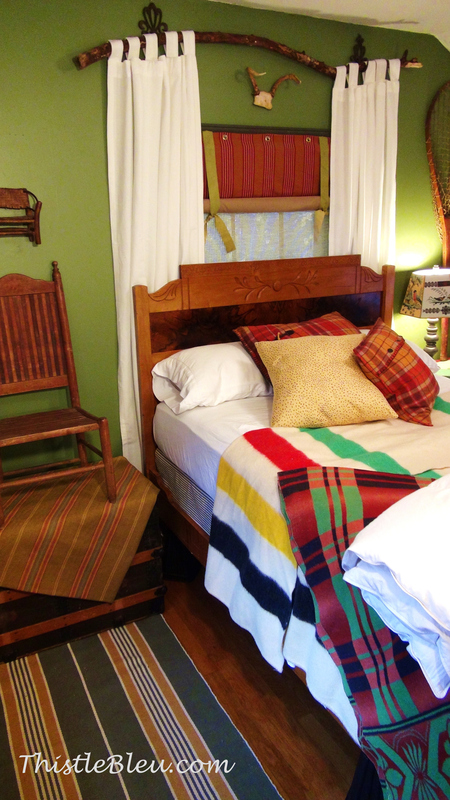 The little milking stool comes in handy so that you don’t have to take a running jump to get into the bed. It is a bit high. I covered this lampshade with a Brunschwig & Fils wallpaper from a discontinued wallpaper book that was going in the bin 20 years ago. 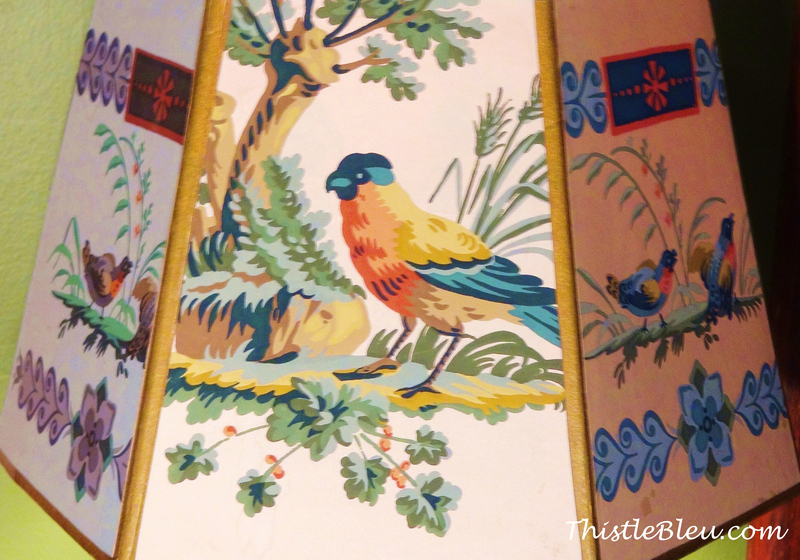 Their wallpapers and fabrics are classics and oh so French. 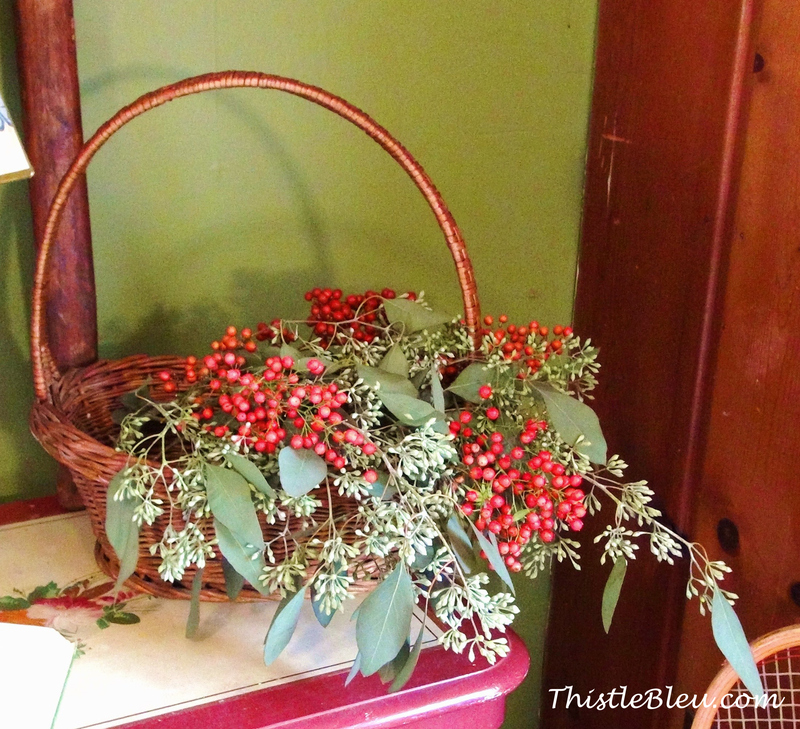 Eucalyptus from the Farmer’s Market and Nandina Berries from my garden. An old floral painting on an antique occasional table. The Hudson Bay blanket rolled up and belted has that campy look. The campaign chair is covered in an old lion and tiger fabric. Black grosgrain ribbon always looks good paired with wicker. 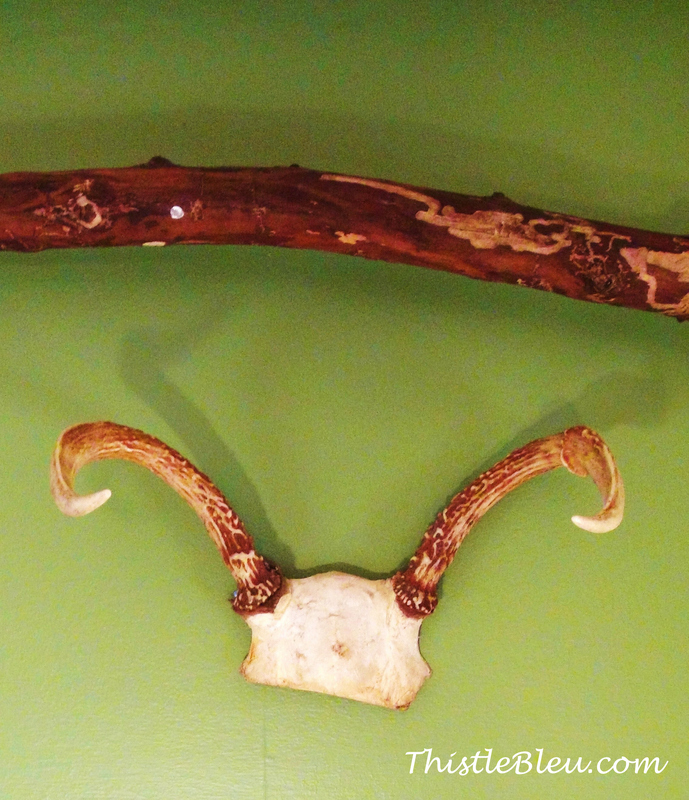 My mom found this hanger in a barn. I am not sure what it was originally used for but it is very useful. This old dresser was my brother’s childhood dresser. I replaced the handles when the old drop pulls fell apart. I actually found them at an Ace Hardware store. 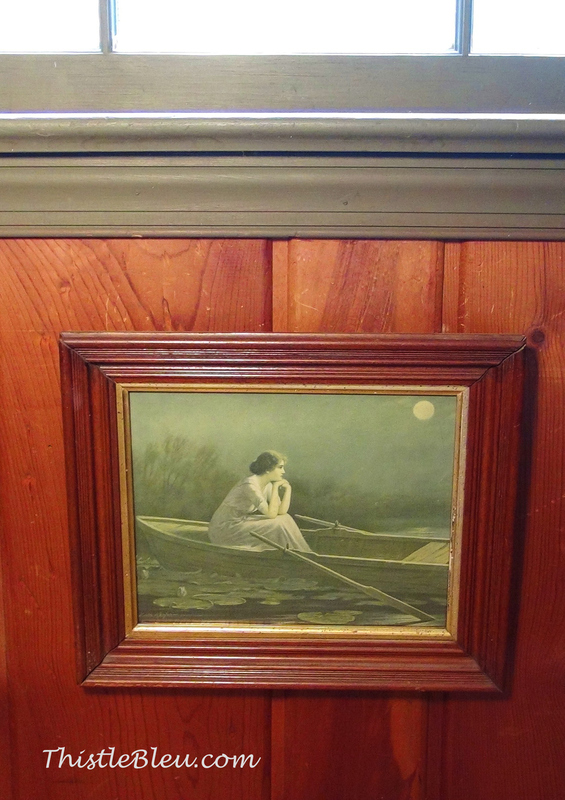 Photos of my husband’s grandmother in Saranac Lake, NY. I bought the coffee pot with a broken lid at a thrift store because it had interesting feet and I figured it would make a good vase. Oh yes, another chair that is not to be sat upon. 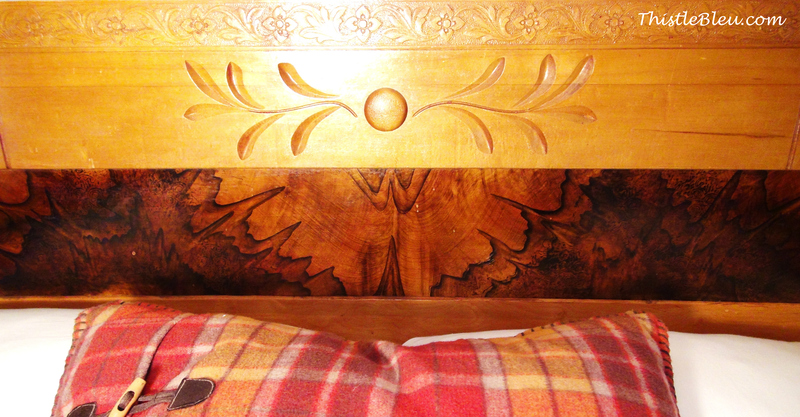 This antique bed was originally faux painted to look like burled wood at the turn of the century. Someone was definitely very artistic because I thought it was burled wood for years. So, there you have it. 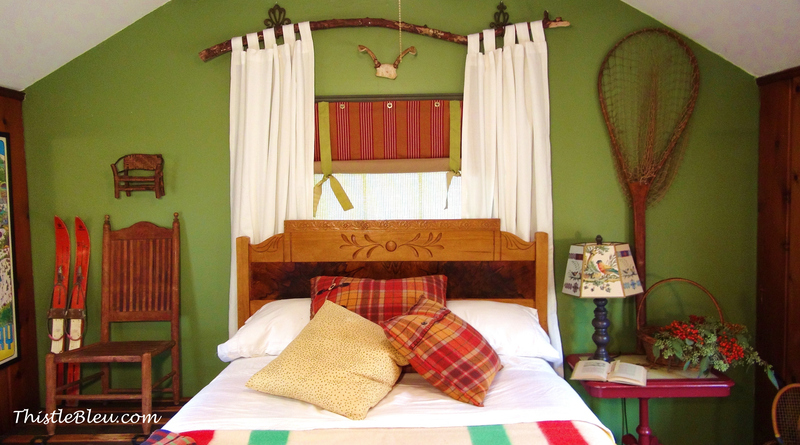 My Adirondacks Inspired Guest Room. Lynette, you hit it out of the park again. You just have a way with color and pattern and mixing it all up. Can’t wait to see what surprises are in store with the revamp! Good work, Lynette! We were amazed to see that Olympic poster. WOW ! What a detailed yet very welcoming room. Warmth, lots of great things to look at, comfortable. Love it. Pinned it too. Love this cozy room! Visiting from Cozy Little House! Love this room! I have several sets of vintage skis. How were you able to hang them like that on the wall? 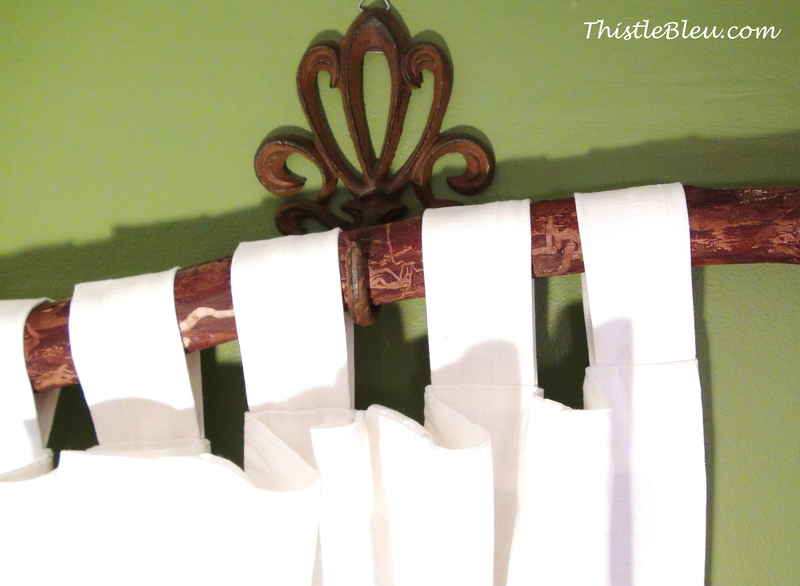 I had thought of doing that but have no idea how to hang them! I wrapped a wire around them after I crisscrossed them and hung them from a nail. Good luck! Thanks so much for your prompt reply! 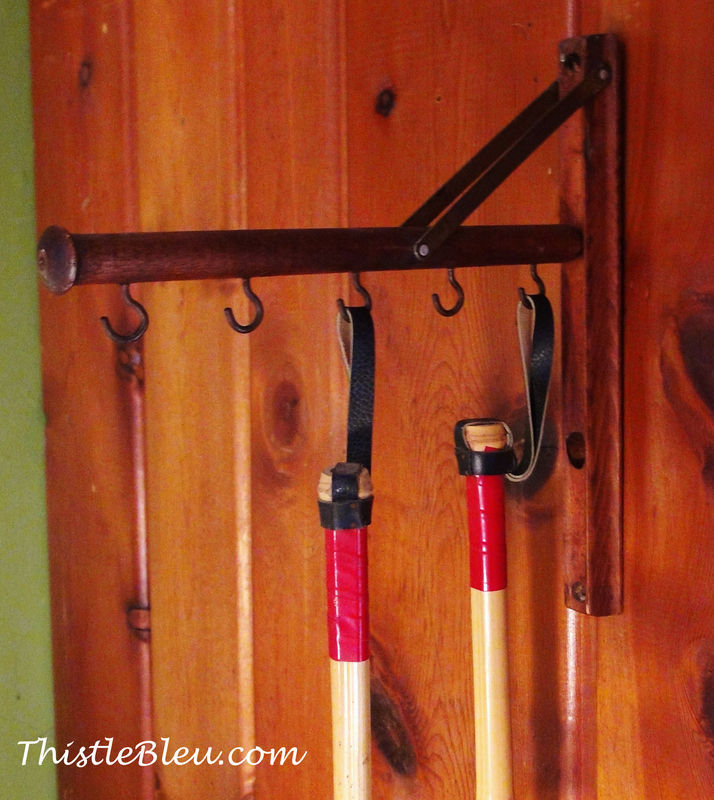 It’s funny that I saw this today after just discussing hanging some of our vintage skis on the wall. You were a great help! I love this room! We have been remodeling our basement for the past several months in an Adirondack theme and have been searching everywhere for the perfect green. Is there any chance that you have the color you used for this room? It’s beautiful.